If you’ve ever sat down and taken a practice (or real) SAT, you’ve come across shaded region questions. They’re among the most iconic question types on the test, so much so that you may find that the memory of them remains with you long after your SAT taking days have passed. True story: I had a roommate in college that used to talk in his sleep sometimes, and one time I woke up in the middle of the night to hear him plaintively moaning about shaded regions. Should you let yourself get intimidated by a shaded region questions? ABSO-EFFING-LUTELY NOT. Say I told you that the area of the entire blob shape in the figure above was 15, and then asked you for the area of the shaded region. It’d be cake, right? All you did was recognize that since areas just add up, and you know that the unshaded areas add up to 10, the shaded region has to make up the rest of the total area. If the total area is 15, and the unshaded part is 10, then the shaded one has to be 5. Easy, yes? Let’s try an example, shall we? 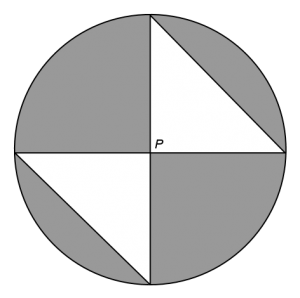 In the figure above, P is the center of the circle and also the intersection of the two right triangles. If the radius of the circle is 3, what is the area of the shaded region? 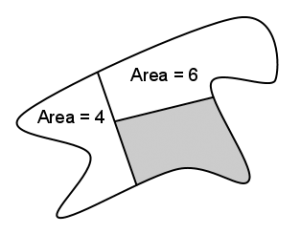 In order to solve for the shaded region, we need to find Awhole and Aunshaded. The area of a circle is πr2, so Awhole = π32 = 9π. What’s the area of the unshaded bits? Note that they’re both right triangles, and that each leg is a radius. In other words, we know the base and height of both triangles are 3. The area of one of the triangles is ½bh = ½(3)(3) = 4.5 Since there are two of the triangles, Aunshaded = 9. That’s choice (C). Easy, right? Just remember Awhole – Aunshaded = Ashaded and you’ll be fine. 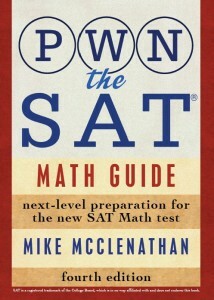 I know this seems painfully obvious, but it’s important to remember that the SAT specializes in making it tricky to deal with concepts that are, on the surface, obvious. Think about Rubin’s Vase (pictured at the top of the post) for a minute. Are you familiar with this image (or this kind of image)? 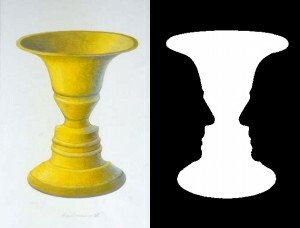 If I told you I was about to show you a picture of a vase and showed you the black and white version, you’d see a vase. But if I told you I was about to show you a picture of two faces and showed you the same image, you’d see the faces. The writers of the SAT, of course, know this. So when they ask you to find the area of a shaded region, they’re usually trying to make you focus on the most difficult thing to find directly (and sometimes, an impossible thing to find directly). That’s why it’s important to always keep the formula above at the front of your mind. If it’s not, you’ll likely find yourself choking down a dish of geometrical futility, drizzled with a balsamic disgruntlement reduction and served with a side of anguish fries. It can happen. Just remember, the SAT would LOVE to misdirect you—to make you focus on the part that’s difficult to solve for, instead of the part that isn’t. But since you’re an expert pattern recognizer, you’re not going to fall for it. You know that the SAT likes to make it difficult to solve directly for the shaded regions, so you’re going to solve for everything else instead. Now go forth, intrepid one. Slay shaded regions, one and all. Practice makes perfect, you know. Also try this previously posted question (post contains an explanation). #20 is really hard. If you think you can explain how to do it, give it a go in the comments. If I think it’s a good explanation, I’ll make it a part of the post, and your name will become synonymous with awe and wonderment. Yes, this one took me a while. For some reason it didn’t click immediately that angle ABC was 90 degrees (should have been obvious), which of course makes it possible to determine the sides AB and BC pretty easily. Sorry, as much as I adore awe and wonderment I am running out the door an cannot provide a commendable explanation. Great web-site btw, check it every day since I saw a post of yours on CC. Thanks for the comment, JD. I tried to obfuscate angle ABC with the givens and by not drawing the diagram exactly to scale. Glad you figured it out, though. CC is a great community…I’m always impressed by the kids who post there. For #13, I got 32pie instead of 31pie. Can you explain this problem? The larger circle has a radius of 7, so its area is 49π. The smaller circles each have a radius of 3, so their areas are both 9π. I’m including a scan of the page in my book where I do this problem. Please explain #11 on the first math drill! thank you! I’ve explained that one already in the comments on that post. Good luck tomorrow!